We love this quick and easy recipe. The smoky-sweet bourbon glaze really complements the sweet flavor of the salmon. In a small frying pan, over medium heat, melt the butter. Stir in the brown sugar. Place the salmon steaks on top of the butter/sugar mixture, meat side down. Cook for 5 minutes. Turn the salmon skin side down. 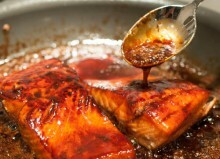 Remove the pan from the heat (to reduce the splatter) and add the bourbon around the salmon. Return to heat and continue cooking for 5 minutes, or until the fish flakes easily with a fork, while spooning the glaze over the salmon. This recipe looks so good… and the whole site is amazing. Congratulations. I may have to tweak a recipe here or there! Wow! Made this last night! Have many salmon recipes, this is my new favorite! Was truly “moan-worthy”! Can’t wait to fix this for dinner guests! Hi Diane — thanks so much for the comment. We’re glad you enjoyed the recipe! It’s one of my favorites as well. Debbie does the majority of the cooking around here, but when it’s my turn to “man” the kitchen this recipe is one my my go-to’s. Always so happy to hear when our recipes work out for others! Love this recipe it’s so easy and delicious I can eat it every day. Thanks for the comment! We’re so happy to hear you like the recipe. We eat it pretty often around here, too.